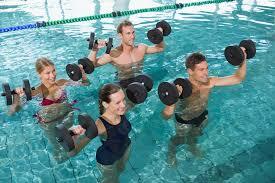 I have been doing a new class at the gym, Aqua Fit. That is not exactly our LA Fitness class in the picture but it may as well be. That is exactly what it looks like. I remember a year ago or something I glanced at Aqua Fit while it was in progress and I saw this big group of men and women of all ages and races and shapes and sizes advancing in the pool like an army, smiling and laughing, hefting these weights. I thought: I should try that! Finally I did. You get to be in a pool which is fun. I love swimming. So if the teacher is late, as is often the case, no big deal. I've learned enough of the exercises so if the teacher doesn't show up, which is often the case, no big deal. If you get a lazy teacher, no big deal. Unlike in Zumba, where a lazy teacher drove me crazy. So. I have been doing this Aqua Fit off and on for about six weeks. And this is the truth: Things fit me that did not fit me before that. No kidding, I bought a pair of pants at the Temple Beth Tzedek sale and they did not fit me then and now they do! And there is nothing else that could have done this for me aside from Aqua Fit. I have made no other lifestyle changes, God knows that. Perhaps it is just that I am going to the gym three or four times a week because I enjoy this class. Perhaps it is the nature of the class. Oh, who knows. There was one thing weighing on me. This is great now that it is summer and you feel like jumping into a pool. What about winter? Then just last night that question was resolved. This other gal in the class, she and I were hanging out in the pool afterwards, paddling around and looking out the floor-to-ceiling windows. She said: "Just wait till it's winter and it's snowing outside. This will be awesome!!" I just needed someone to point that out! The important thing is, it's fun, and it works. On top of everything else the class is easy as pie. It is not like Boot Camp or even Pilates. Pilates feels great but it is work, I will tell you that. There have been Pilates classes where I have rolled over on my mat afterwards and thought: I am ready now to audition for the Alvin Ailey. I am a superhero to have gotten through this class. Aqua Fit on the other hand is a walk in the park. Exercise does not have to be miserable! Today my friend Lizzie and I spotted an estate sale sign and, as usual, screeched to a stop. The sale turned out to be bittersweet. 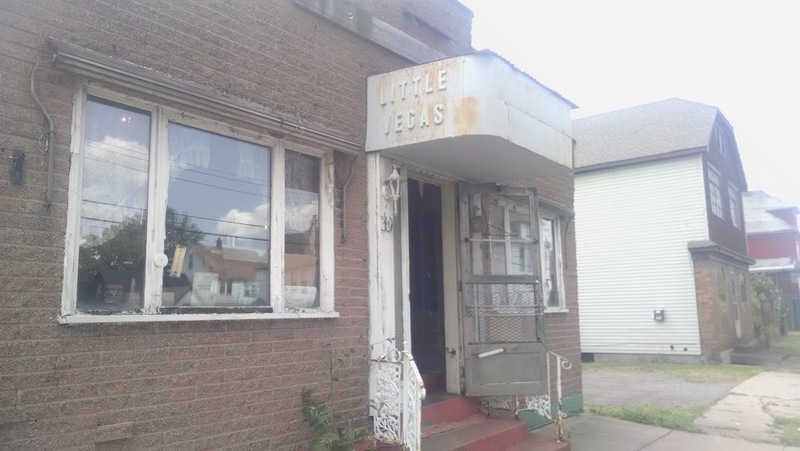 It was the Little Vegas tavern in Lackawanna. 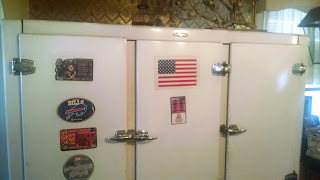 The tavern had been a stop a few years ago on a Forgotten Buffalo tour we were on! Lizzie reminded me of that. And I remembered -- well, sort of anyway. I must have had a good time on that tour, what can I say. Well, what happened in Little Vegas stays in Little Vegas. Inside we learned it was the last day of the sale. 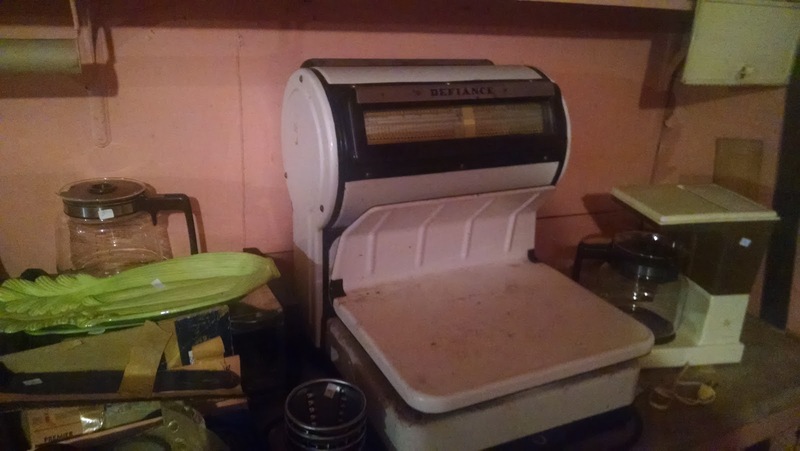 The owners' daughter was pretty much taking all offers. I tried to talk her into stretching the sale out for another weekend, so I could help get the word out about it. But she was in a hurry to get back to Florida. Which, I can understand. You can only take so much of this kind of stuff, you know? I regret I did not buy the cash register. 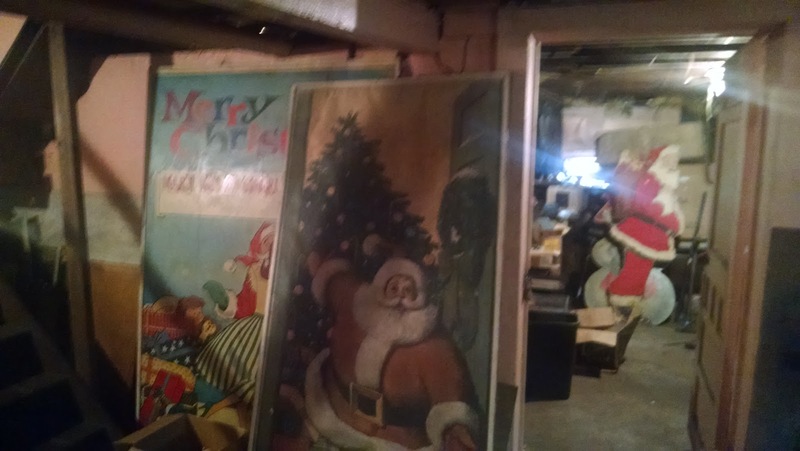 And a case could have been made for buying these vintage Santas and other Christmas decorations that were in the basement. You could just imagine the bar's regulars waiting every year for these old fellows to reappear. 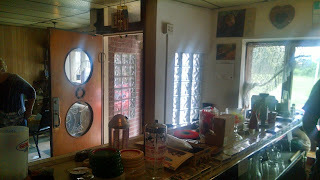 There were tons of decks of playing cards behind the bar. Of course I went behind the bar just so I could feel what it would be like. I took this picture from behind the bar. And yes, I did say, "What can I do you for?" And: "You and me both." The playing cards must have been in keeping with the bar's name. I tried to interest Howard in the vintage beer cooler but to no avail. Howard is less sentimental than I am. I am sentimental! I did also love this old scale. In the end I bought a chalkboard for $2 and Lizzie spent a couple of bucks on some very cool decorations. We had to have some kind of memento. It is a pity saying farewell to an old bar even if it was not exactly on your turf. These mom-and-pop taverns are disappearing. As I just put on Twitter, we watched the eclipse old school at The Buffalo News. Scott Scanlon, my neighboring colleague in the newsroom, remembered the old Boy Scout trick where you poke a hole in the cardboard. That is the eclipse pictured at left! We were all excited bounding down the stairs to give it a try. 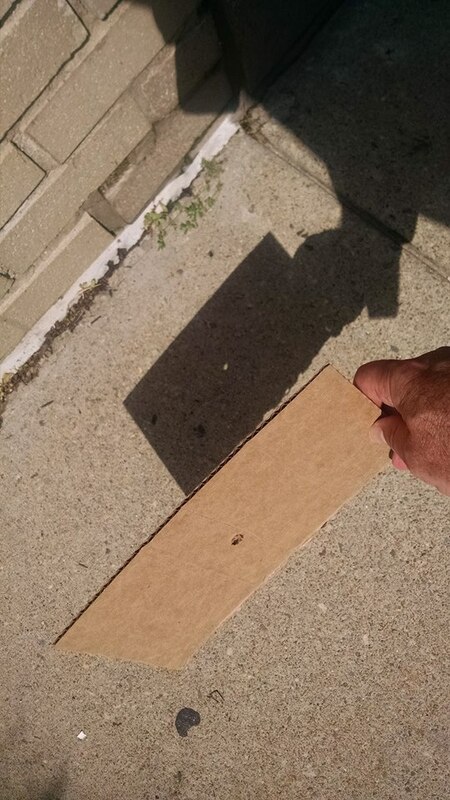 Scott is the editor of Refresh, the health section, which explains why he takes the stairs and also why he views the eclipse safely with a piece of cardboard. Outside we found almost everyone else in the office already out there. Of course the really cool people were the people who stayed inside at their desks and didn't care at all. However I have never attempted to be cool and that has served me well in life. One was that in Buffalo, it began at 1:11 and hit its peak at 2:34. You went from 1-1-1 to 2-3-4. It was easy to remember and that is how Scott and I knew enough to go downstairs at about 2:30. Another is that when was the last eclipse like this, 1919? Somewhere around then. Leonard Pennario went through his whole life without seeing such a thing! It got Howard and me thinking about other eclipses in history and one thing we pondered was whether there was an eclipse mentioned in the Bible anywhere. I thought of the Crucifixion when darkness descended over the land. And the curtain in the Tabernacle was torn from top to bottom, and the dead came out of their graves and walked around and were seen by many. I am sorry, once I start with this, I cannot stop! That could have been an eclipse, however, if it were, it would be a lunar eclipse, not a solar. There are scholars who have figured that out. And apparently there was a lunar eclipse in 33 A.D. I will have to look into this further. When eclipses occurred in Biblical times, would someone have been there with a piece of papyrus with a hole poked in it? This is the coffee wreath I brought to the St. Anthony's coffee hour this morning. Despite the fact that I made it kind of on the fly, in between going to a wedding, going to the reception, and taking care of other business. .. it came out well! The same cannot be said of this week's Bundt cake. This was a lemon Bundt. Everything was perfect except for it did not come out of the pan. Half of it was in crumbles. And may I point out this is the second time this Bundt pan has stuck it to me. Third time. This was the pan that soured me on Bundt cakes to begin with, now that I think about it. The cake stuck. Then it stuck again a couple of weeks ago, though not so badly. Strike three, you're out! I personally took that pan out to the garbage. A sorry end to a pan I had greeted with such joy. Maybe it was my fault. Maybe when I made my first cake I scratched it too much or something. Well, whatever. So for now I will stick with the Kugelhopf pan that worked well for me. As far as the lemon cake, half of it was served at the St. Anthony's coffee hour. It was gone in 60 seconds, rivaled only by these gooey brownies someone brought and the Monsignor's manicotti. I brought the other half of the cake home and am going to do something with it. Cake pops, perhaps? Bread pudding? I am leaning toward cake pops because I have never made them. Lemon flavored cake pops, yummy! As a result of the lemon of a cake pan. For some reason I like doing art. I use the term loosely. I do not have any pretentions as an artist. 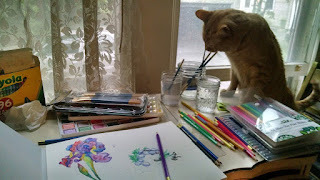 But late at night, or of an afternoon when I have been busy with work most of the day, it is fun to sit down with watercolors and relax. 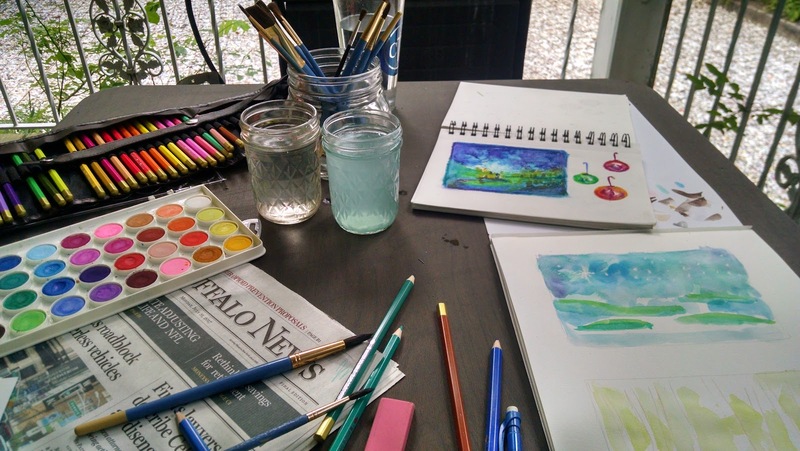 What is it about watercolors? They are just so cheap and easy. Especially cheap. 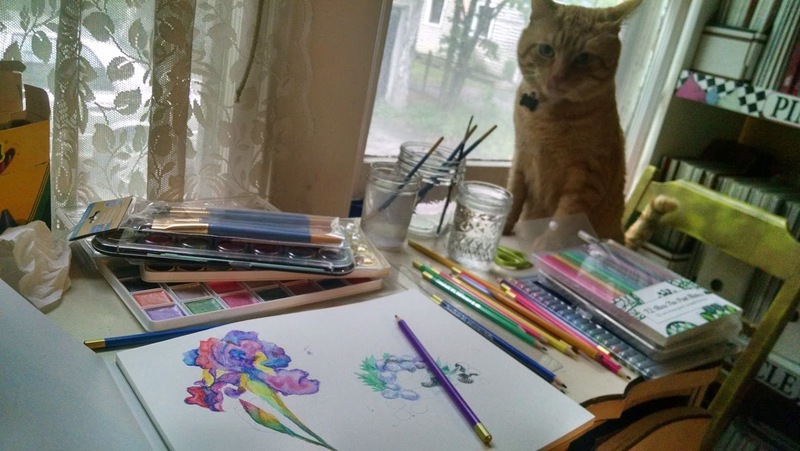 I have this $5 watercolor set I have been working off of forever. That is it in the picture above! I also have a sneaking affection for oil pastels because they, too, are cheap. That masterpiece in the sketchbook visible in thePain back on the right was done with oil pastels. 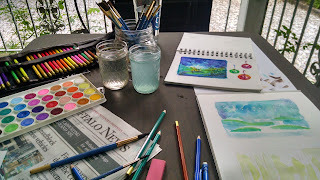 Not only that but they were oil pastels I purchased in Tupperware at a garage sale! 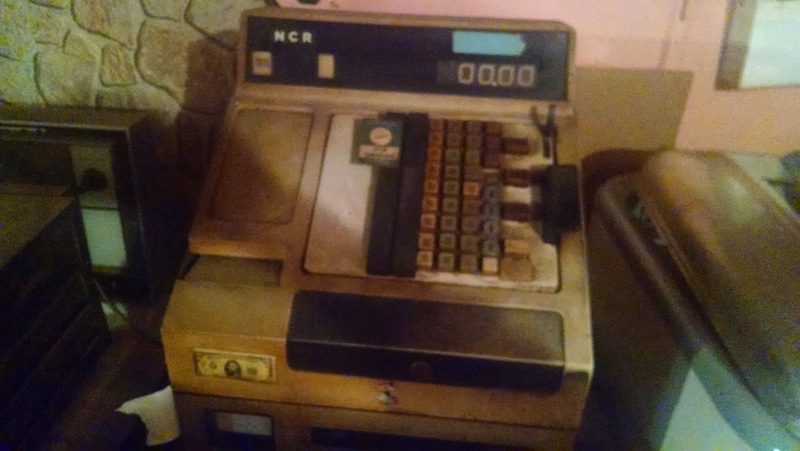 I think I paid a quarter. The brand is Loew-Cornell, which despite the patrician name is made in China, let's not kid ourselves. I remember my mom telling me at that garage sale that buying the pastels was worth it just to get the Tupperware! LOL! Anyway, those are the pastels that painted that picture in the picture. HOWEVER. Once at another garage sale I bought a little wooden box of oil pastels of the Van Gogh brand. Van Gogh is not an exalted brand. Looking it up, I see it is a "student brand." However. sets of 10 or something (mine has 15) go for a cool $30 or something. So when I get better at oil pastel I will let myself use the Van Gogh pastels instead of the Loew-Cornells. I will be the Leonard Pennario of pastels! Last week I made my second Bundt cake for church. The first, a week before that, was a big breakthrough. I know, Bundt cakes are not supposed to be a huge challenge. 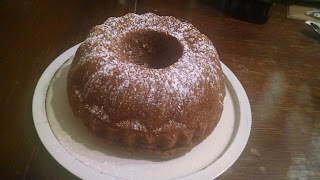 However, years ago, I had attempted a Bundt cake, and it had stuck to the pan. I did something with the cake, I made a bread pudding. But I never forgot the outrage. And I never attempted another Bundt cake. Until just recently. This is the beauty of participating in our church coffee hour, at St. Anthony of Padua Church. I like to make a game out of it and try to do new things. 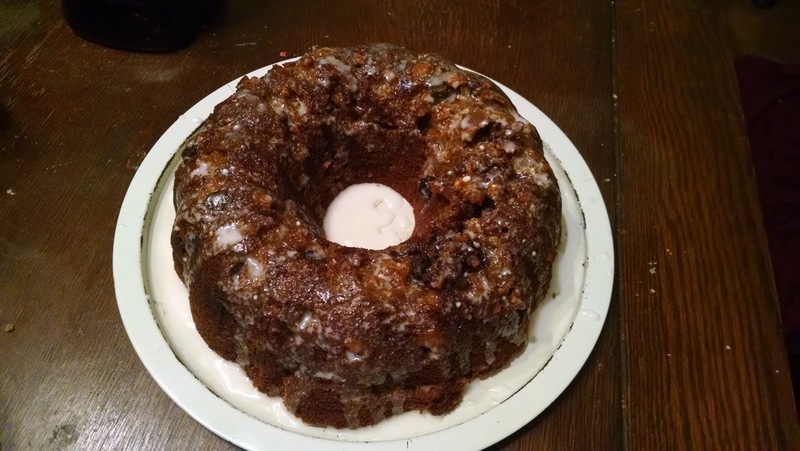 I made a Whiskey Squash Cake out of a Reader's Digest cookbook I have. It was a recipe I had had my eye on for some time. Whiskey, got to love it. I almost subbed rum because Rum Squash Cake sounds good too, and I am sure it would work. But I had to go with Whiskey. 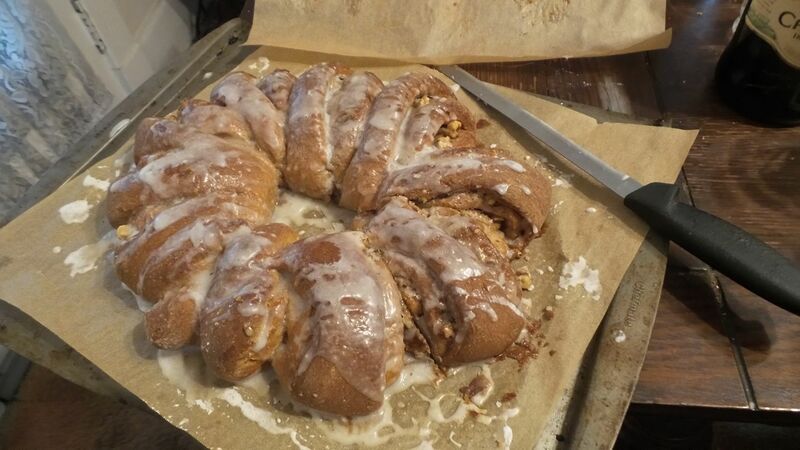 I baked the cake in my Kugelhopf pan which previously I had used only for yeast breads. Hmmm. Consulting Wikipedia just now I see that Kugelhopf -- well, they say Gugelhopf -- is the original Bundt pan. Nordicware copyrighted the name Bundt in the 1950s and '60s. Whatever my pan is called, let me tell you, I oiled and floured that pan half to death. That cake came out with its hands up! I sugared it up and took this picture. So, success!!! Drunk on my success I made the cake pictured at the top of this post. It is a Banana Cream Cake. Oh, excuse me, Banana Creme. It has sour cream in it, is the reason for the name. I used my other Bundt pan for that. Remember that pan? You can make cakes in it from all over the world. I took the cake to coffee hour. Gone in 60 seconds!! I never had a bite! But I can assume it was good. And so forward I will go as the Leonard Pennario of Bundt cake bakers.